Technically, Charlotte's first Halloween was spent in the hospital. I gave birth to her (via c-section) on October 28th. As most of you probably already know, if you give birth via c-section - you're in for a much longer hospital stay. Halloween was the last thing on our mind at that point. That is why we consider the Halloween of 2011 Charlotte's first Halloween. 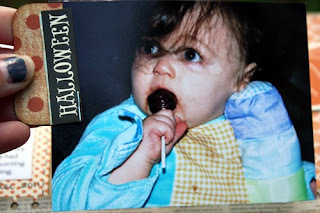 She was able to trick or treat and have plenty of fun. We dress her up as a cute little elephant and took her around the town. I didn't want this layout to be overly "spooky". I just wanted it to have a simple "fall' feel to it. I'll save the spooky for when Charlotte gets older. I did this layout with one of Shimelle's weekend challenges in mind (create a page using three or more paper collections). The base paper for each page is the "Double Dot" paper by Bo Bunny. The squares are made up of papers from Authentique's "Glowing" collection, American Craft's "Nightfall" collection, and Pink Paislee's "Prairie Hill" collection. The little pocket is cut from some older paper by Amy Tangerine. The little cards inside the pocket are cut out from Echo Park's This and That - Charming" collection along with the border that is above the photos. I punched the border with the Binding Edge punch by EK SUCCESS. The banner at the bottom is cut out from some of Authentique's cardstock. I stamped it with a Hero Arts woodgrain stamp. The "You Make Me Smile Everyday" sticker and star sticker are from Pink Paislee's "Prairie Hill" collection. 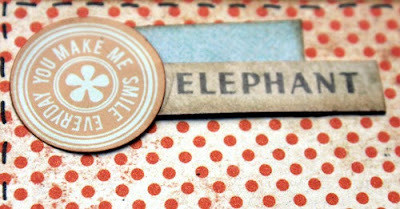 The "Elephant" sticker and the "October" sticker were both actually cut out from larger Tim Holtz stickers. The chipboard pumpkins are from Bella Blvd's Finally Fall collection. 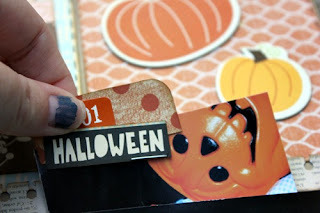 The "Halloween" labels are from American Crafts "Nightfall" collection. The "No 01" label is from Amy Tangerine. The swirly bit that is underneath the word October is from Authentique's Delightful collection. As you can see, this layout is interactive. I have two extra pictures that are adhered together tucked away in the back of the last photo. The title is made up of Thickers and Bella Blvd alpha stickers. Great page! Love the various patterned papers and the cute pocket! Great layout-- love the pocket! Great 2page layout! 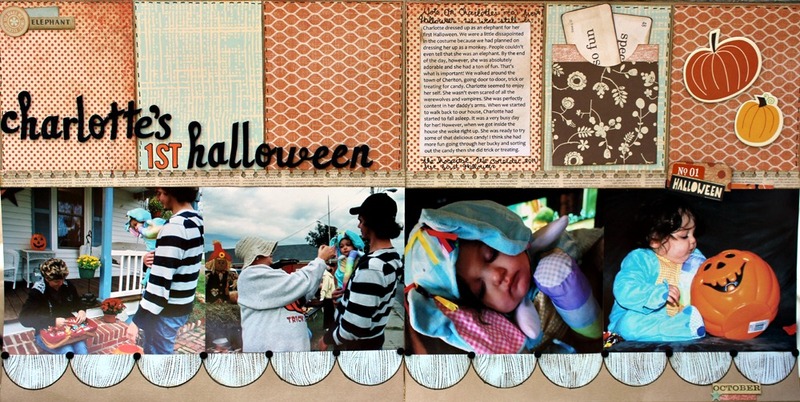 I agree that I don't like the halloween layout to be too spooky, especially with babies. Great costume!!! I love it! The pahe looks great too.